ExtendedHand on Wheelchair "Smart wheelchair"
While the user manipulates a projected virtual hand by the user's right hand, haptic feedback is provided to the other hand in our system. The more fingers the haptic feedback is given, the stronger the sense of touching real object and the body ownership to the projected virtual hand. 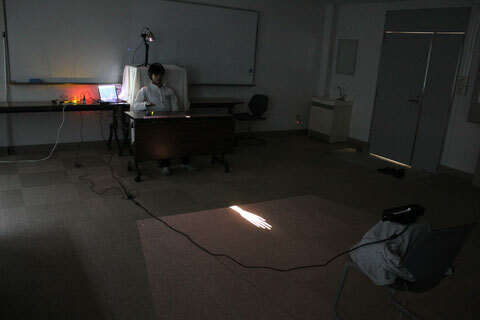 Naruki Tanabe, Yushi Sato, Kohei Morita, Michiya Inagaki, Yuichi Fujino, Parinya Punpongsanon, Haruka Matsukura, Daisuke Iwai, and Kosuke Sato, “fARFEEL: Providing Haptic Sensation of Touched Objects using Visuo-Haptic Feedback”, In Proceedings of IEEE VR 2019 Demonstrations, D03, 2019. Naruki Tanabe, Yuki Asai, Ryuichi Enomoto, Haruka Matsukura, Daisuke Iwai, and Kosuke Sato, "An Investigation on Haptic Feedback to Non-Manipulating Hand in Manipulating Virtual Hand", In Proceedings of Interaction 2018 (Japanese conference), pp. 785-790, 2018. Naruki Tanabe, Yuki Asai, Ryuichi Enomoto, Yuta Ueda, Daisuke Iwai, and Kosuke Sato, "A Study on Haptic Feedback to Non-Manipulating Hand in Body Extended Interface", In Proceedings of SCI'17 (Japanese conference), 142-5 (6 pages)，2017. Yuki Asai, Yuta Ueda, Daisuke Iwai, and Kosuke Sato, "Projection-Based Body Augmentation System on Smart Wheelchair", Assistive & Accessible Computing, Vol. AAC-2017-3 No.14. 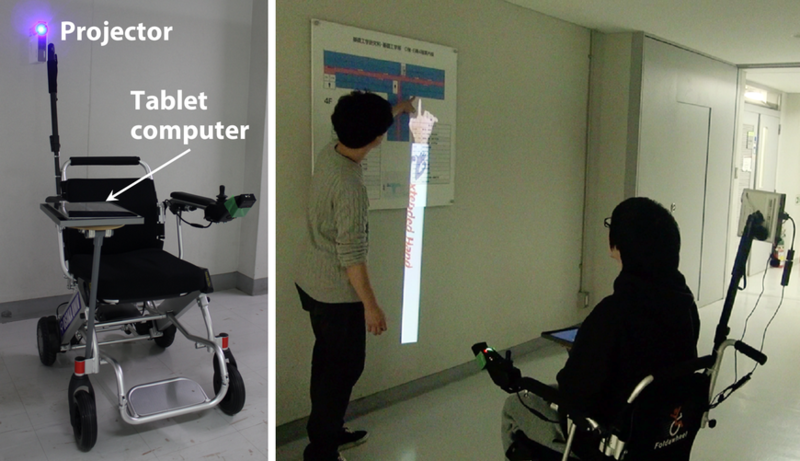 Yuki Asai, Yuta Ueda, Daisuke Iwai, and Kosuke Sato, "A Smart Wheelchair having Projected Virtual Hand", In Proceedings of SCI'16 (Japanese conference), 325-1(6 pages), 2016. Enomoto Ryuichi, Yuta Ueda, Takuya Shimmei, Daisuke Iwai, and Kosuke Sato, "A study on discrimination and ownership of virtual hands in multiuser environment", In Proceedings of SCI'16 (Japanese conference), 325-2(6 pages), 2016. Yuta Ueda, Daisuke Iwai, and Kosuke Sato,"InstantReach: Virtual Hand Interaction using Smartphone", In USB　Proceedings of IEEE International Symposium on Mixed and Augmented Reality, S&T Demos 14, 2015. Yuta Ueda, Yuki Asai, Ryuichi Enomoto, Takuya Shimmei, Noriko Takemura, Daisuke Iwai, and Kosuke Sato, "Tablet-based Body-extending Interface for Gesture Communication ～Stand-alone ExtendedHand～", In Proceedings of Interaction 2016 (Japanese conference), pp.1004-pp.1009, 2016. Yuta Ueda, Daisuke Iwai, and Kosuke Sato, "Touch Screen-Based Hand Estimation for Manipulating Virtual Hand", In Proceedings of SCI'15 (Japanese conference), 343-3 (4 pages), 2015.